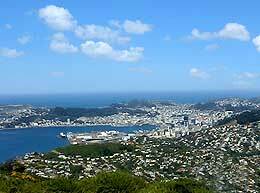 The city of Wellington stands on the southern coastline of the North Island of New Zealand, alongside the Cook Strait and the Pacific Ocean. Wellington is famed for its spectacular sandy beaches, which offer an excellent selection of water sports, including surfing and scuba diving. Other highlights in Wellington include a high concentration of Victorian architecture, a bustling harbour area lined with attractions, and more than its fair share of top restaurants and shopping districts.